A landmark, seminal work of Japanese film is Akira Kurosawa’s Yojimbo. Released in 1961 following the 1950s ‘golden age’ of Japanese cinema, Yojimbo unwaveringly upholds the qualities of a classic period epic. 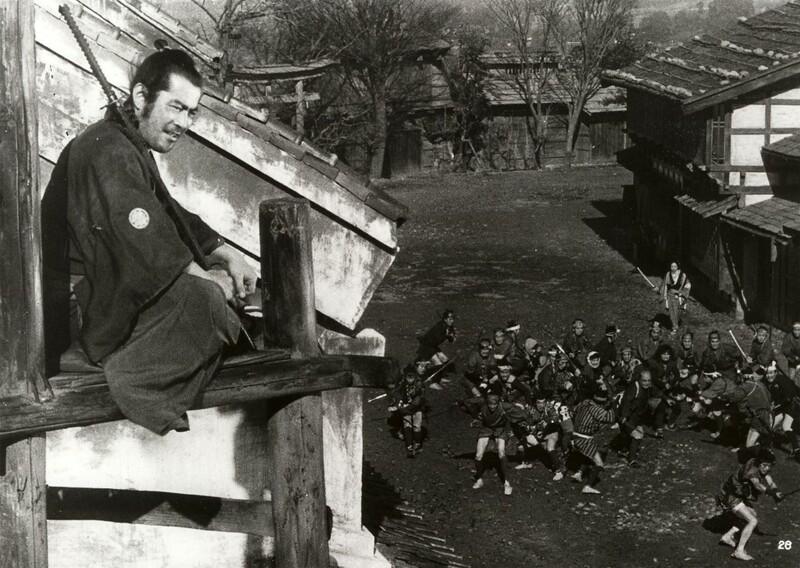 Set in 1860 in the dying years of the samurai and the final decade of the Tokugawa shogunate, the plot follows the wandering rōnin Sanjuro (Toshiro Mifune) as he strays into a small, dilapidated town. Divided by two embattled gangs vying for control. Greeted in the initial scenes of a dog with a severed human hand in its mouth, the message is quickly received that it’s not a town in harmony with itself. The animosities stir between Seibei and Ushtora and their gangs, and their respective backers; Tazaemon, a merchant and the town’s mayor, and Tokuemon, a local sake brewer. Dissuaded by and sceptical of both sides, Sanjuro decides to surreptitiously offer his services to both sides. Deftly vying each gang against each other and stoking the feuds, Sanjuro works towards his goal of ridding the town of both gangs. The dusty Western style visuals fit the picture perfectly as barricaded windows and sabotage ensue across the desolate town. Following the abduction of Seibei’s son and future successor Yoichiro, Seibei holds a woman captive who holds the affections of Tokuemon. With the intention of the menacing brothel-owner Seibei to swap the woman for Yoichiro, Sanjuro intervenes in rescuing her and returning her to her husband. All before the virtuous samurai becomes a target himself. The film’s defining essence lies in its brilliantly crafted cinematography. With quick cutting scenes and lengthy sequence, the choreography – by no means a spot on today’s standards – was a defining feature of its time, displaying the intensity of samurai combat. Equally, the Western-esque camera work with the suspended long shots and the deserted main street scenes where the standoffs and violence play out, it is of no wonder that Kurosawa’s Hollywood influences resulted in questioning in terms of Japanese authenticity, in comparison to other notable directors such as Ozu and Mizoguchi.